Some friend of mine said that, peng, you are too Americanized, you watch Hollywood movies instead of Chinese movies, you like hip hop music, you like hang out in nightclub, your favorite beer brand is budweiser, you like friends, prison break, gossip girl……yep, what my friends said is true, I hardly watch Chinese movie and Chinese show, sometimes I think those are nothing but waste of my time, because there are so much copy in the movie and the show, this kind of stuff make me sick. And I just don’t want make a fool of myself. I think here are some reasons to explain why I love tofu so much. First of all, tofu is delicious, I’m living in the northeast of china, and here has the best soil for planting grain, soy and other foods, so, we got the Chinese best soy, with the best soy, tofu made in haerbin, got an amazing taste, I can eat allot even without any cooking, just a bit salt and some spring onion. And my mom like fried tofu, and put some salt and spring onion, a bit sugar, maybe a little chili, make it tiny hot, my mouth is watering again. 😀 And it always make my mom very hesitant, irresolute, because every time, I got myself stuffed, even can’t move. Tofu killer. Second, tofu is good for health, as we all know, tofu is made from soy, and soy is full with protein, little fat, little carbohydrate. Some statistical data shows that having tofu frequently could reduce the rate of heart disease. It’s real. My father is a vegetarian. He was eating tofu daily, and my father’s heart is strong enough so that he can run 5 kilometers every day now, and he is so powerful. He can lift heavy stuff up easily. I guess tofu take effect. 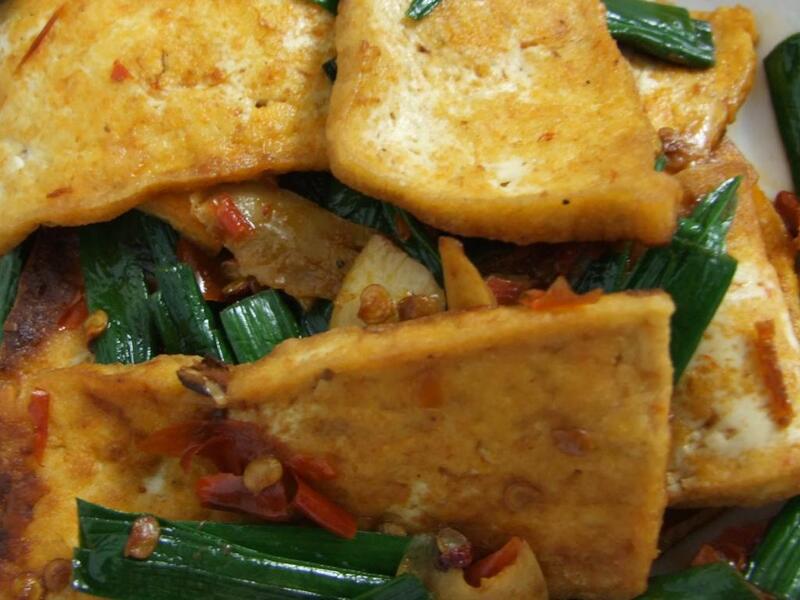 And the third reason is, I really think tofu is a symbol of china culture. Make soy into tofu is really a hard work, grating the soy into pieces, collecting the juice, make the juice solidify, and constrict it again and again, some antique chinese believed that the process of making tofu is reflecting the philosophy of Chinese. And I’m so proud that I’m a Chinese because of the Chinese food, the tofu, it’s weird. But I really got this thinking. The fourth reason, tofu is very cheap, my mom like to buy tofu in a famous supermarket, I think it’s the best tofu in town, it’s about 5 “yuan” (Chinese money unit) one kilogram, it’s about 70 cent. It’s the best tofu and also be the most expensive. And in china, pork is 36 yuan one kilogram. See high quality life doesn’t amount to high spending. So I can’t image how my life will be without tofu, if you like tofu too, and you have a chance to visit china, I suggest you to come to my house and have a taste of my mom’s cooking. My mouth is watering once again, what’s wrong with my mouth, maybe I should go to see a doctor. haha~~yep, most yummy food is not good for health, you like tofu too?! sweet, if you got a chance to visit china, you do must come to my home and be my guest please, try my mother’s cooking, the best cooking i have ever had. and my mother is a funny housewife. heehee~~it sound like i’m advertising 😀 thank you, tia. but i think tofu in the States must be different from the one i had, because the early chinese emigrant to American came from south china, and south china tofu is not as good as the north one, because of the quality of soy, but maybe in American is better, American’s soy is famous.